HTC will be holding a special press event this Wednesday September 19th which we are excited to be attending ourselves. The company has been struggling as of late as Samsung has taken over the Android market with its Galaxy line. HTC since then has said that they will be going BIG on Windows Phone and from what has been ‘leaked’ so far, no one is in a position to doubt them. Back in August, information about 3 upcoming Windows Phone 8 devices by HTC made its way onto the Internet. The devices were dubbed the HTC Rio, Accord and Zenith. The weird part was that images weren’t leaked but the specificatons were. It shows that the Rio looks to be the entry level device while the Accord and Zenith are packing much more under the hood. added to these rumors are the fact that 1 or more of these devices will be packing Beats Audio. Now, since then we have heard tons more about one of the devices which is the HTC Accord and boy have we seen alot of the device. 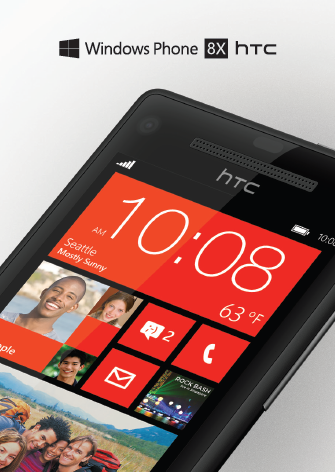 Even a promo image showing off the final name HTC 8X. Yesterday, we saw the possible leak of the HTC Zenith under the name HTC Elation. Which turned out to be a fake since it included Nokia apps on the start screen. Hopefully all of this equals a strong showing of Windows Phones at the HTC event and we will be right there to give you the details. Written by: Hyde13 on September 18, 2012. If the one in the picture is their flagship….then HTC will produce DOA devices. Its hideous. I think the 920 sucked the life out of all competitive handsets, especially WP devices.